It literally felt like my heart was going to come right out of my chest. It was pounding so fast that I couldn’t concentrate on anything else. I waited in the wings, first in line to enter on stage. I normally didn’t get that nervous, but I guess the fact that the one person I wanted to please was there had an effect on me. The elegant, peaceful music started; our pastel-colored, fancy dresses flowed perfectly; every move intertwined with the next. We slid from the wings to center stage, and back to the wings. It was the longest dance of the recital, and as we disappeared off stage, the audience started to clap. They thought it was over, but we were emphasizing the grand entrance of… our fathers. My heart began to beat heavily all over again as my dad grabbed my hand and pulled me towards him. We performed the routine just as expected, demonstrating the relationship between father and daughter. If only the audience knew that my father and I didn’t really have one. I’d seen him only a few times in the past few years. We were going through a phase where we had more important things to do. The only definite time I would see him, other than holidays, was my annual dance recital. I was amazed by the feeling of my dad holding me again while dancing; the activity I loved most. When I stroll pass City Theater, I tend to focus on the simple things that mean so much. I stare at the cracked concrete outside the entrance, wondering how it was damaged. I enjoy the odd-shaped sign that announces what shows are playing; because of the personality it gives the building. I notice the people who enter the theater, realizing that it’s for everyone and anyone. And then I remember the chills that I felt when I stood on the cracked concrete below the unique sign, as I watched people enter on that special night. If I had the choice, I would go back to that moment in City Theater and live it all over again; from the unfamiliar nervousness while waiting in the wings, to the end when my dad handed me a single red rose. Post by Sarah Pettengill. Photos by Carolyn Gosselin. This post is one in a series written by seniors from Biddeford High School for Portraits of Place. Three years ago, English Teacher Carolyn Gosselin began collaborating with the Heart of Biddeford, a nonprofit organization dedicated to the renewal of Biddeford’s Main Street area. Since then, youth voices have become influential in community planning, as students discover the proud history of this evolving mill town and share their perspectives on its renaissance. Thank you for writing this story. For me, you made an inanimate object, a building, come to life. And, your honesty is courageous. Thanks for sharing your story Sarah. The City Theater sign was a local landmark for me growing up but I have only been inside a few times. You really made the building come alive! Your first few lines were definitely intriguing, leading me to finish the post. Your honest emotions pulled this piece together making it bring this blog to life as well as The City Theatre. 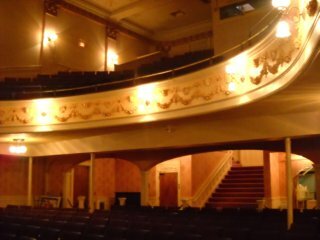 I think it is cool how The City Theater in Biddeford holds a connection with you and your dad. I have never been in the city theatre and I walk by it all the time. It always looks closed and nothing ever going on so makes it kind of look uninviting to me. But now that I have read this little article it strikes my curiosity to actually now go and have a look at what the people call haunted. I think you did a really good job with the way you described the City Theatre and that you described a emeory you had there with your father. I feel like the way you wrote this, it made me feel like i was actually there. 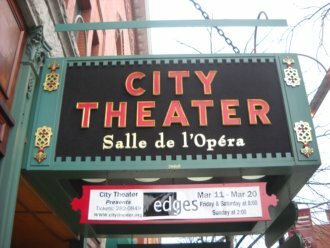 I remember going to city theater, but I never pictured it as a place that you spend time to dance, and become closer to your family and friends. Thank you for sharing your story, it was inspirational. sarah, you did a really good job. i like how you shared your story and made a connection. I thought your piece was very moving. I feel like it is important to stay connected to your loved ones. I hope you two become closer. Good luck girl. very discriptive, makes it feel like you were right there with her.